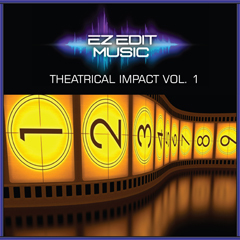 THEATRICAL IMPACT VOL. 1 – Welcome to EZ Edit Music ! As you can see, there are two versions of each song available to license (purchase). You can license the "stereo-mix only" version, which includes both .wav and .mp3 files; OR you can license the "stereo-mix plus stems" version, which also includes four "stems" or sub-mixes of the complete mix; allowing you to separate and re-mix various combinations of instruments to create an endless amount of variation in musical content for your project. To re-mix the stems, you will need some sort of multi-track audio editor or "DAW", available for Mac, PC and mobile (iOS etc.) platforms. Smartphone users: if you are unable to view the "purchase" buttons, try turning your phone sideways to the 'landscape' position; or simply view our website on a tablet or computer. This collection is comprised of music loops that are useful for content that has a theatrical or dramatic mood; and features many different orchestral acoustic instruments. "Night Pursuit" Stereo-mix plus stems. "Time Forgotten" Stereo-mix plus stems. "Another Road" Stereo-mix plus stems. "Don't Look Now" Stereo-mix plus stems. "The Dark Matters" Stereo-mix plus stems. "Pencil Me In" Stereo-mix plus stems. "The Truth Hurts" Stereo-mix plus stems. "Covert Mission" Stereo-mix plus stems. "The Revealing" Stereo-mix plus stems. "The Hunt Is On" Stereo-mix plus stems.